In early 1992, after working in various parts of the book business for many years, two friends (Gloria and Roberta) decided that Northeast Portland needed a good neighborhood bookstore and that we were the ones to make it happen. We borrowed money from family and friends, found the perfect location with a prince of a landlord, and set ourselves to the task of making an old furniture store into a bookstore. After a few months of very hard work, we ordered what seemed to us like millions of books and hired a few good people and opened our doors on May 15th. As we grew into our space and filled up our shelves, we came to know this neighborhood as business people as well as residents. Our friends became our customers, and our customers became our friends. After five years, we added a computer. After twelve years, we had paid back all of our loans and we were still in business! 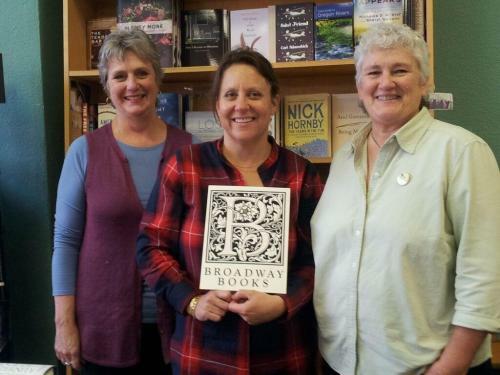 After thirteen years, Gloria retired from ownership (although we’re a happy family and she still works here occasionally) and Roberta was the sole owner of Broadway Books until April of 2007, when Sally became a partner in the business and a new era began in the story of our store. Since Sally’s arrival, we’ve added this website, become active on social networking sites such as Facebook and Twitter and Youtube, and established our much-followed blog. We’re selling eBooks now, and customers can also shop our shelves online, 24/7. So much has changed in the bookselling world since we opened, and change comes faster and faster! We know that changing with the times is part of what keeps stores like ours alive. More changes are afoot in 2015, with Roberta's retirement (although she is still very much a part of Broadway Books), and the addition of Kim Bissell as Sally's new business partner. There are some things, however, that do not change. We strive to always offer our customers the service and attention they deserve. This includes hosting dynamite events that feature both established and emerging writers, supporting neighborhood schools and literary organizations, hiring people who are knowledgeable and passionate about what we sell, and continually refining our inventory mix (new, used, and sale books as well as a few carefully chosen sidelines such as reading glasses, calendars, puzzles and games) to keep our stock fresh and eclectic. We also started out with the pink card, and can’t imagine living without it. After you purchase twelve new print books at regular price using our pink frequent buyer card, you’ll get a free book of your choice. Ask us for details. We have seen ourselves and our neighborhood and the city of Portland through good times and bad. The lean years are scary and the fat years are fun. In our first twenty years, we’ve seen much change on NE Broadway. Many businesses have come and gone. And we’re here to say that owning a small independent bookstore is not for the faint of heart. But we can’t think of anything we’d rather be doing. We’ll never get rich this way. But we’ll never be bored. How many are lucky enough to love coming to work every day? Thanks to everyone – family, friends, customers, employees – who are part of our story.